This is the transcript of a talk delivered by late Prof. Kasturi many years ago. This is being brought to you from our archives and we regret that we do not have the exact date of this talk, but we can say with reasonable surety that it was in the year 1987. 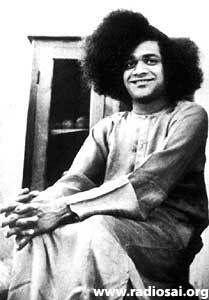 It is a very difficult assignment that has been given to me to speak on Sai Baba. Because He is a phenomenon that has so many facets; and that is yet a mystery - though I have been with Him for over 30 years now. The longer you are with Him, the more mysterious He becomes. And He Himself has acknowledged and declared that it is very difficult to understand Him; not just recently when people tried to investigate Him, but even from His boyhood. In the spiritual museum that they have in the college which was opened about 15 days ago (most likely, September 24, 1987), there is a letter - a photocopy of a letter - that Baba wrote to His elder brother when He was 21 years old. The date is there as 1947, when there was no post office in Puttaparthi. The nearest post office was five miles away. As you can see from the note paper, it talks of the Bukkapatanam post office and not the Puttaparthi or Prashanti Nilayam post office. 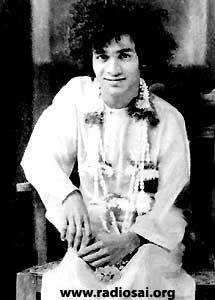 It has also got a picture of Baba as He appeared at that time. His elder brother was rather disappointed with Him because he had great hopes that he would pass His university examinations and get into some cushy job whereas He had given up His studies and was collecting people around Him, and was being lionized by all sorts of people. He thought that He had strayed away from the usual path of educated people in our country. So he wrote to Him a letter protesting against His behavior. And this letter was in reply to that. 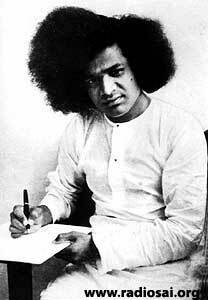 In that letter, because His elder brother was a Telegu pundit, Baba wanted to go one step over His elder brother and replied in poetry - His elder brother also reveled in poetry. And there you will find Baba saying the purpose of His coming. Imagine a young man of twenty saying that He has no name! That He will answer to everywhere. And that whichever place you belong to now, that is His place. Every place is His place. If we see the present and what it is becoming - the whole world is His place. Now imagine this for a boy who has lived in Puttaparthi – somebody has described it as a village which is five minutes from the Stone Age – born in that village, and in a very poor family. (Baba did not have money to even purchase buttons for His shirts. And He used to have thorns collected from thorny plants – long ones – and used them for His buttons). Imagine a boy born in such circumstances; studying in a school up to what we call the fourth form (grade) and leaving school after two months, during his fifth form. I went to that school and inspected the admissions register and the furniture. And sat on that same bench in which He was sitting when He was studying. Think of a boy like that, in fourth form, two months and into fifth form, talking of mankind? “I have come on a Mission …"
Now, this particular line has been explained by Baba in another manner. “Ananyas Chintayantomam…” Ananya chinta is usually explained as single minded, that is, ‘without any other thought if they worship Me’; some people interpret it as without loyalty to anybody else or without any other thought. “They should not be worried by any other thought. They must rely entirely on Me, dedicated entirely to Me.” That is the usual meaning that is given to this quotation. God and His Devotee are One! That is the new interpretation that Baba has given. “He is another” this feeling you should not have, because there is no another. We are all One. And if something happens to somebody, it is as good as or as bad as happening to us. That apart, what are these niyama and nishtha? 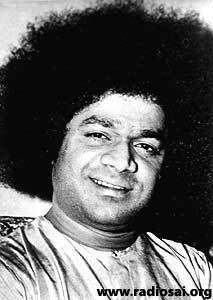 What are these conditions that Baba says, “which alone will enable you to get My grace.” Of course He has later on explained that it is not formal worship that He requires. 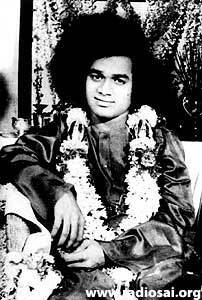 He gives some meaning for all that and says that what you must do to worship Him is only Sathya, Dharma, Shanti, and Prema (Truth, Righteousness, Peace and Love). It is the inner attitude that is. He doesn’t care whether you address Him as Rama, Krishna, Shiva or Rajarajeshwari. Once during the final day of Dasara – the ten day period of the worship of God as a Mother, we worshipped Him. We made Him sit and adored Him chanting the Lalitha Sahasranaama (1008 names of Mother Goddess). And He was sitting all the time. Imagine, how is it possible for Him to tolerate being worshipped as Mother Lalitha? Or being praised as God? Anybody’s head would turn. Imagine if you and I were worshipped as God! I feel miserable even when I am put on this extra height, and given a soft cushion and kept at least fifteen feet away from you as if I am a very important person who should not mix with you, or sit intimately with you. So, how much more miserable should a man feel if he is not genuine, and if he is simply made to sit twice a day, and you are praising Him as Lord Rama, Krishna, Shiva, Mother Gauri and Saraswathi without end; something must be wrong with his brains if he tolerates all that. But He is very clear headed and a very competent person, and that itself is an indication that He must be some phenomenon which you and I cannot understand. Coming back to niyama and nishtha, His conditions for adoration and reverence are quite different. You may belong to any religion; you may address Him by any name. As a matter of fact, some of you must have read Arnold Schulman’s book. He has written a book called “Baba”. It is an interesting book in where he says that he came over to India, and like many tourists, he too had a list of things that he must see in India like the Tajmahal, a cobra probably, a tiger hunt, and then a yogi. He thought it rather strange and he congratulated himself that he had seen a ‘yogi’. Then he went back. And he writes: “I went back to the familiar world of mouthwash and deodorant.” Further he says, “I have been to India and I have seen the much talked of yogis and I have found them to be a set of exploiters and the disciples are psychopathic compulsives.” So he dismissed the whole lot of gurus, teachers and yogis in India as systematic exploiters and psychopathic compulsives. And then, Baba worked up on him. Whenever He speaks, you must have observed that He quotes or sings one poem. Once He started with a song about Himself. Vishwamellada Vyapiyeevelayuvaadu. Which means, “He who is present all over the world”. It is not exactly ‘world’, you may say, all over the cosmos. When Baba went to East Africa and returned, there was a big meeting to welcome Him home as if He had gone somewhere across the seas. It was considered a great achievement by His devotees. 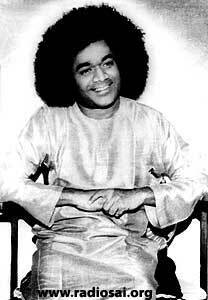 People ask me very often, “Has Baba gone to foreign countries?” Because it is then that we value a person more. And when I say, “Yes, He has been to Africa”, they rather look with quizzical eyes! Going to Africa of all places! First, he should go to America and return, because we are honored there! But Africa! But Baba first goes only to countries that are just coming out of their colonial rule and are trying to find their feet and are relatively poor. To continue the story, at that public meeting, I was translating His discourse in Telugu into English. The platform was about thirty feet wide. He was at one end, I was on the other. And then He started saying, “What is all this function that you have arranged? I have been only to one of the rooms of My mansion! When the master of the house comes from the drawing room to the dining room, you don’t make a big fuss and say, ‘oh He has come from one room to another’ and we have a meeting and garland Him, and then praise Him that He has come.” In essence, He was saying all this is nonsense. Then He used the word Prapancha mey na illu. And I translated it. Of course, it is sometimes difficult to get the right word quickly. So I said, “The world is My mansion.” And I was rather proud that I used the word ‘mansion’ for ‘illu’. So I was bucked up with myself and thought everybody will appreciate that word. I didn’t say ‘house’ or ‘home’ or some of those common place things, but a much better term - ‘mansion’. So I patted myself on the back. But then Baba turned to me and said, ‘No!” It is difficult to translate Baba. Because He not only speaks in Telugu, but He watches the English and tries to find out from where all the ideas have come! You must have seen Dr. Bhagavantam (who used to translate often in the 1970s) being corrected a number of times. So, when He turned to me and said, “No!” It gave me a shiver. “No! Not the world!” He said shaking His finger at me. And then He proceeded towards me. I thought that was the end of it. I am no good. He was going to ask me to clear out. Therefore, when He was proceeding towards me, I also proceeded towards Him, because if He was going to give me a slap or something it is better to receive it half way than compel Him and make Him walk the whole distance! So I came right to the center. And at the center, luckily there was no mike, so only I who could hear what He said; otherwise the whole audience would have heard it. But it was worth hearing. He said, “No! Not the world, but the Universe!” And, of course, I stood aghast! Imagine a person, a five foot figure, standing before you and saying, “The Universe is My mansion!” I was, in fact, ‘taller’ and ‘older’ than Him! More ‘educated’ you can say, translating His speeches. It is something very thrilling that you could have a person of that human form and size declaring: “No, not the world! The Universe!” When He corrected me in that fashion, I simply fell at His feet. And fifty thousand people watched this and wondered ‘What is this man doing?’ Then He gently pulled me up by the shoulder and directed me towards the mike and said, “Carry on your work.” Now, that is Baba.